North American gamers will get to experience 3D Dot Game Heroes before the summer, with a pretty low price of entry. Anyone who knows anything could have figured out that Atlus would be publishing From Software's 3D Dot Game Heroes when it was confirmed for North America by an anonymous source, and this has indeed turned out to be true. Atlus was that source, and will be bringing the retro-styled PlayStation 3 RPG to the U.S. on May 11, 2010. Atlus knocked it out of the park by bringing From Software's Demon's Souls to the U.S., and no doubt wanted to nab the more whimsical 3D Dot Game Heroes as soon as it could. The game's "gimmick" is that the world and its characters are made of pixel-like cubes, and it has a gameplay style similar to that of the NES or SNES Legend of Zelda titles. Demon's Souls undeniably proved that there is an audience that wants RPGs on the PS3, though if the mainstream part of that audience is willing to switch from the mature visuals of Souls to the more cartoon-ish visuals of Heroes remains to be seen. I hope you didn't stop reading yet, because there's one more major piece to this story: 3D Dot Game Heroes will be super cheap, for a PlayStation 3 game anyway. 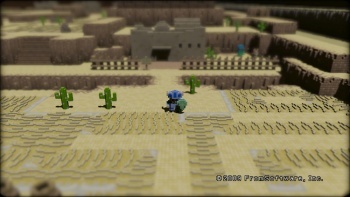 Releasing with an MSRP of $39.99, Atlus has made 3D Dot Game Heroes a must-buy for any PS3 owner. That's right, even if you only bought your PS3 to use as a Blu-ray player, I am telling you to buy 3D Dot Game Heroes. "The 8- and 16-bit classics many gamers cut their teeth on are magical, down to their blocky sprites and elegantly simple gameplay," mused Aram Jabbari, Manager of PR and Sales for Atlus, while twirling his rattail and wearing a poorly coordinated denim-on-denim outfit. "3D Dot Game Heroes captures all of that legendary charm and more, bringing classic visuals, familar sounds, and a grand sense of exploration and discovery into stunning next-gen realization, all the while giving countless winks and nudges to the fans those iconic games mean the most to. This is pure action-adventure gaming at its finest, a true love-letter to a time-honored genre," he added while putting baseball cards in the spokes of his 10-speed. 3D Dot Game Heroes' official website is available here.